Published in the South Kent Gazette, 20 August, 1980. In the absence of definite information, there have been many surmises as to when, and by whom, this church was built. Dugdale writes: "In the year of grace 180, reigned in Britain, Lucius. He became a Christian under Pope Eleutherius, and served God and advanced the Holy Church as much as he could. Amongst other benefits he made a church in this castle, where the people of the town received the Sacraments.“ Darell, in his History of the Castle, writes to the same effect, and adds that “King Lucius appointed priests to perform divine service in this church, and assigned for their maintenance the toll paid by shipping.“ It is further stated that after this early Christian church was built, the nation again relapsed into heathenism, after the martyrdom of St Alban, and the church was profaned. Meanwhile, it appears that the civil part of the population formed their first settlement on the piece of void land between the Roman works and the face of the cliff, and the church of St Giles is said to have been built there for their use; but no trace of it has ever been found. The church of St Mary, built by King Lucius, seems to have been restored by King Eadbald, who founded a college of six canons in connection with it, fixing their quarters at Colton Gate. These statements as to the castle church are regarded as more or less doubtful traditions; but all antiquarians agree in ascribing to the Castle church a very ancient origin. The Rev Canon Puckle, who very minutely examined the structure during its restoration in 1860, and Mr Loftus Brock, Secretary of the Royal Archaeological Institute, both regarded this church as of the Roman period; and the Rev S. P. H. Statham, who appears to have very carefully considered all that has been written about it, came to the conclusion that the church “was originally built as a Roman fortress, probably in the first century of the Christian era, and converted into a church during the last century of the Roman occupation of Britain.“ Such authorities may be safely accepted, and the venerable edifice, which crowns the Castle Hill, may be confidently regarded as the earliest, or one of the earliest churches in this island, and the first place of Christian worship that existed in Dover. This church fell into ruin about 1690, and was restored by Sir Gilbert Scott in 1860. The bells of the church were hung in the Pharos tower; but when it ceased to be used, they were given to a church at Portsmouth, from which originated the saying that the bells of Dover Castle could be heard at Portsmouth. According to records at Portsmouth the gift of the bells was made by Prince George of Denmark, husband of Queen Anne, when he was Lord Warden of the Cinque Ports. During the six centuries of Saxon rule, the earthworks of the Castle were extended, and strengthened by the erection of towers and walls. Having encased the southern part of the Roman oval with masonry, on the western side of that wall they built a continuation called the Saxon Curtain, connecting the Roman work with the Colton tower, which, during the Saxon period, formed the entrance to the Castle. King Eadbald, about the year A.D. 620, continued the wall, in a westerly direction, to the slope of the hill, and then, turning at a right angle northward, continued to a point opposite the present Norman Keep, and within the angle thus enclosed (the old drill ground) were built the houses of King Eadbald’s canons, who, later, were transferred by King Withred to St Martin-le-Grand, in the Market Place. On the eastern side of the Roman oval, the Saxons, not long before the Conquest, built Godwin's tower and other strong works from which a gallery led to a postern opening into Knight's Bottom, now known as the Northfall Meadow. 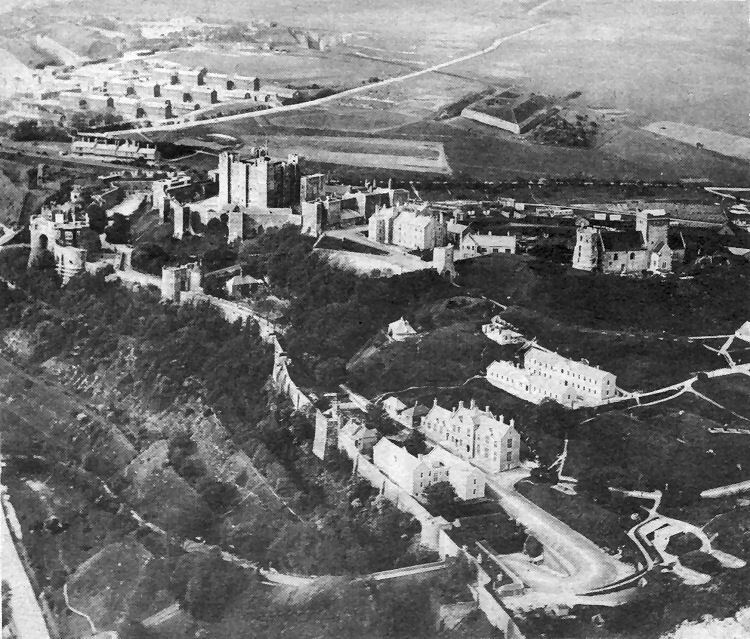 A fine aerial photograph of Dover Castle, the Pharos and the church of St. Mary-in-the-Castle, with Connaught Barracks in the background and its adjacent fortifications date from Napoleonic times. The photograph is believed to date from the 1930s. Note the bare slopes off Castle Hill (left) between the lower entrance to the castle and Constable’s Tower. These slopes are now densely wooded. A number of buildings in the foreground have been demolished along with others close to Colton Tower, in the centre, where there are now large car parks for visitors. 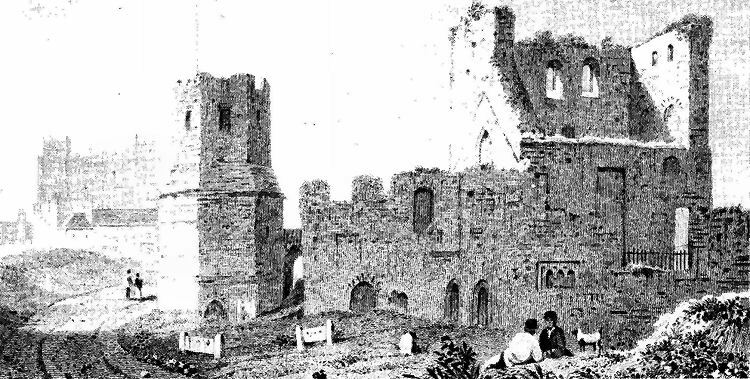 The illustration, above, is an 1824 engraving of the Castle, Pharos and Castle church ruin as it appeared at that time, viewed from the seaward side.